As written about on our TiVo Networking page, when multiple TiVo DVRs are on the same TiVo.com account and the same in-house network, they can use Multi Room Viewing to share programs from one to another, with certain restrictions. If this feature is available and active, it will show in the bottom of your Now Playing List. You'll see an icon and list item for each other DVR on the network, and by opening that, you'll be able to browse the Now Playing List of that other unit. From there, you can select the shows to be transfered to this unit. But what do you do if you can't see the other DVRs from this one? Here we explore the two main reasons why a seemingly correct system fails to work properly. The TiVo DVRs must be Series2 or Series3, without integrated DirecTV tuners. The DVRs must have active service from TiVo. TiVo Basic does not support these features. 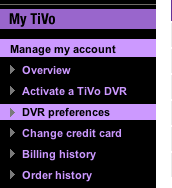 The TiVos must have service paid for on the same TiVo.com account. TiVos from different accounts cannot share programs. The TiVos must be networked. They cannot share shows over a phone line. Assuming all of the above is true, there are two likely reasons why transfers may not be possible: The TiVos doesn't know they're authorized for transfers, or the TiVos are actually on different networks. From here, be sure that “Allow Transfers” is checked for each DVR on the account. If the option isn’t available for a DVR, that means that the DVR in question doesn’t support networking. If your unit already has this option checked, then you may need to “refresh” the unit to be sure it’s fully communicating with the TiVo server. This loss of communication can occur with a hard drive change or an OS update or for various other reasons. To “refresh” the setting, uncheck the “Allow Transfers” preference for the DVR in question on this screen. Then choose the “Save Preferences” button. Next, on the TiVo itself, force a connection over the network to the TiVo servers. To do this, navigate to TiVo Central -> Messages & Settings -> Settings -> Phone & Network and then choose the option “Connect to the TiVo service now.” After that is complete, the TiVo should learn that it cannot transfer shows. Now, enable transfers again on the TiVo.com website, and save the preference again. Then force another connection from your TiVo to the server. See if other TiVos show in your Now Playing List at this point. If that doesn’t do the trick, try fix 2. This section deals with a common network problem: different subnets. A "subnet" is an isolated area of a network, generally with an IP address list in a reserved area of the IP space specifically for networks behind gateways and/or routers. This is extremely common in homes and small offices - almost all home networks use subnets. Essentially, in addition to adding security to the network, this also enables several network devices to share one public IP address to communicate with the outside world. The router, then, creates a table of the local IP addresses, and figures out what traffic from the outside internet goes to what computer or other network device on the inside network. This inside network is where computers typically have lower security enabled, which allows computers to share files, printers, etc. For two TiVos to talk across a network, they need to be on the same subnet. They scan this internal area to see what other DVR is out there, and they check to see if both units are on the same account and if each has "Allow Transfers" enabled. So if your Now Playing List doesn't contain entries for the other TiVo(s) on your network at the very bottom, then it's possible they aren't on the same subnet. To determine this, go to your TiVo Central -> Messages & Settings -> Settings -> Phone & Network. On that screen, first verify your subnet mask. Essentially, this "mask" tells your device that if certain other devices have similar IP addresses to this one, then they are "local" and they don't need to go through a gateway to talk to each other. The most common subnet mask, and the only one we'll cover here, is 255.255.255.0. In almost all cases, this will be what your TiVo shows. What this basically says is, if the first three sets of numbers (octets) between the dots are the same on another device as they are on this one, that other device is on the same subnet, or local. Now, assuming your shows 255.255.255.0, then make sure that, in fact, you are on the same subnet. So see if your IP address (in the area marked "IP addr. :") is the same as that of the other TiVo DVR, except for the numbers after the final dot. Also be sure they both have the same information for their routers. What should you do if they aren't on the same subnet, as evidenced by these numbers? Most likely, that means you're on two different wireless networks. If you're using wireless, you should check the network names. If the names are generic (like "linksys") it may mean that there are two networks with the same name floating around in that area. If that's the case, reconfigure your router with a unique name (and, you should be using WPA also, to keep hackers off your network). In some cases, you can show the right information on each unit, and still you aren't on the same network. That's because in the subnet world, the internal IP addresses are reused. Most start with 192.168 for the first two octets. So it's possible the two TiVos are on different networks that use the same subnet set. If that's possible, and it's not a WiFi issue (see above) then you may be plugged into different networks in the same location. The best test of this is to hardwire each unit to the same router, and reboot each.